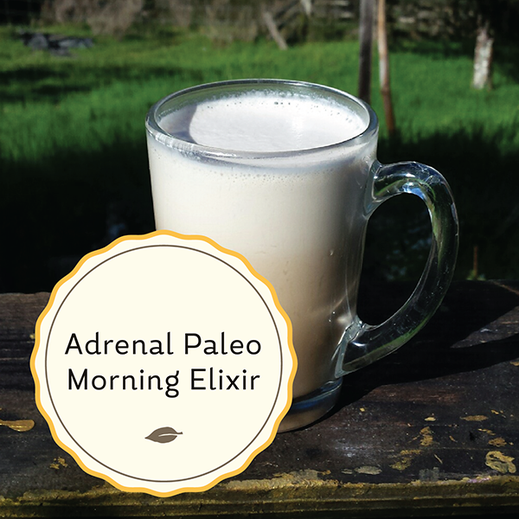 Adrenal Paleo Morning Elixir - Radiant Reality | Nutrition. Healing Arts. Inspired Living. - Kidney jing herb that is a primordial yin herb renown for its ability to build up and restore adrenal function. - For a additional adrenal boost, this herb is one of the most popular and highly revered tonic herbs in Asian herbalism, known for its properties as a brain tonic, it properties have been described as both energizing and calming. - Powerful antiviral herb from the Amazon. Useful for chronic infections in the body. - Anti inflammatory, anti bacterial, anti fungal, anti candida, anti parasite. This multifaceted herb comes from the evergreen tea. - Medium chain fatty acids that are believed to be largely missing from the SAD diet of Americans. MCT oil has been shown to support the gut environment, act as an anti inflammatory and helps the body absorb fat soluble nutrients from food. - These peptides ( highly recommended from grass fed source) contain the same amino acids of gelatin, supporting neurotransmitter health, skin, hormones, bone and joint health and digestion. - Known to support the immune system, it also enhances glutathione production, increases energy, promotes beneficial bacteria in the gut. Simmer for at least 20 min. Start slowly with a small cup and increase gradually as the herbs can have a laxative effect if they are used in large amounts. The tea base can be used for 2-3 more batches afterwards! Download this recipe and enjoy in preparing! Is this the wonderful tea concoction you made for me at The Bulletproof conference? I remember it well. It was delicious and very satisfying. I downloaded the recipe. thanks!